The Temp&Hum 6 click is a smart temperature and humidity sensing Click board™, packed with the features that grant an easy and simple integration into any design. It is a perfect choice for various consumer and industry related applications, such as indoor weather stations, thermostats and humidistats, microenvironment centers, respiratory therapy applications, and similar. Thanks to its advanced logic back-end, the sensor IC can offer measurement readings in Kelvin and %RH directly, over the I2C interface. Featuring a smart and accurate temperature and humidity sensor IC, the Temp&Hum 6 click is a perfect solution for a wide range of applications that rely on accurate temperature and humidity measurements. By reducing the workload of the host microcontroller (MCU), it makes the software development much simpler and faster, while reducing the power consumption at the same time. 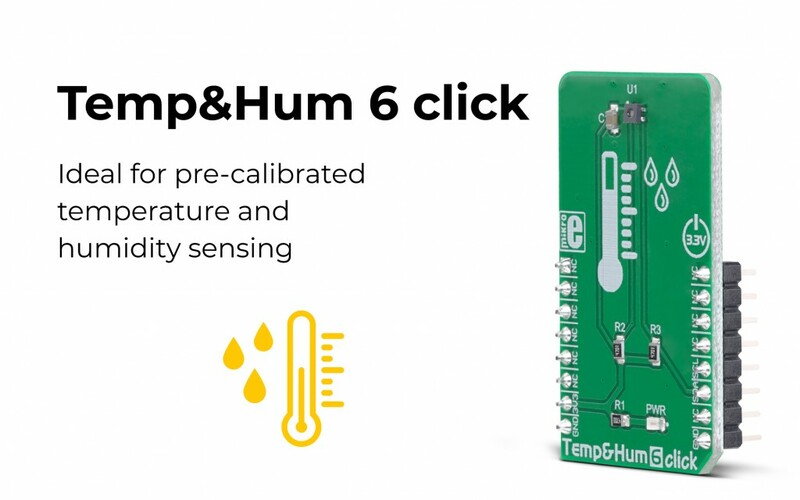 For more information about the Temp&Hum 6 click, please visit our website.